And We All Scream for Ice Cream….. This year DQ® is celebrating Miracle Treat Day with even more magic. 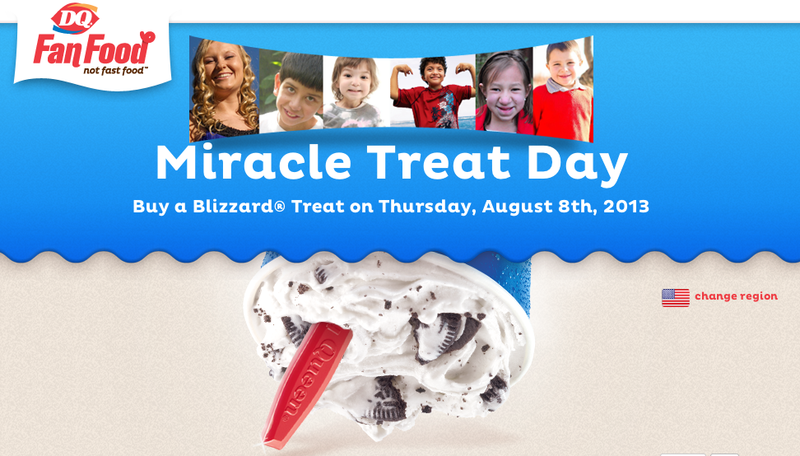 On Thursday August 8th, 2013, $1 or more* from every Blizzard®Treat purchased at participating DQ® stores will be donated to Children’s Miracle Network Hospitals. In addition to that, for the second year in a row, your Facebook RSVP to Miracle Treat Day will also be matched with a $1 donation to the cause—up to $50,000. Together we can provide hope and healing to sick children in your community. Let’s make miracles happen. I can’t think of a better reason to go treat my kiddos & myself (of course) to a S’mores blizzard… yummmmm Hope to see you there!